This is The Challenger HO Scale Electric Train Set by Bachmann Trains. This is a great product if you like trains and are looking for a starter kit. Bachmann's exclusive E-Z Track snap-fit track and roadbed system. E-Z Track snap-fit track (with steel rail) and roadbed system: eleven 18" radius curved, one 18" radius curved terminal rerailer. "Great Set for the Price." 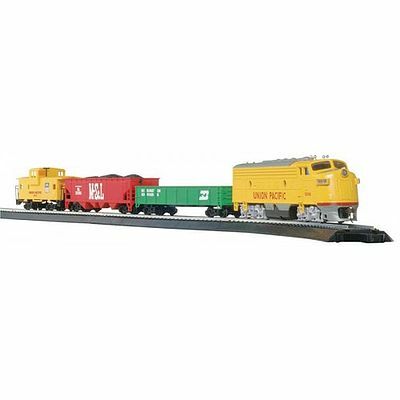 Great bachmann HO Scale set if you are expanding your E-Z track layout and are in need of some extra locomotive and freight cars. "Could not go wrong on the price"
My train layout is Union Pacific, and I came across this set and thought it would be a nice addition. Besides Im partial to the older F9 & F7 engines.